The abbreviations for the tracks of the 4-year-old Canadian-bred filly’s success, however, might tax the acumen of veterans. • AsD – Assiniboia Downs, Winnipeg, Manitoba, venue for victories in June, July, August and September by a combined margin of 19 lengths and wins Nos. 1, 3, 4 and 6 in the streak. • Cby – Canterbury Park, Shakopee, Minnesota, site of Win No. 2, by 2 ¾ lengths. • NP – Northlands Park, Edmonton, Alberta, where win No. 5 was notched on August 25 in monetarily the biggest race of the string, a $75,000 stakes. 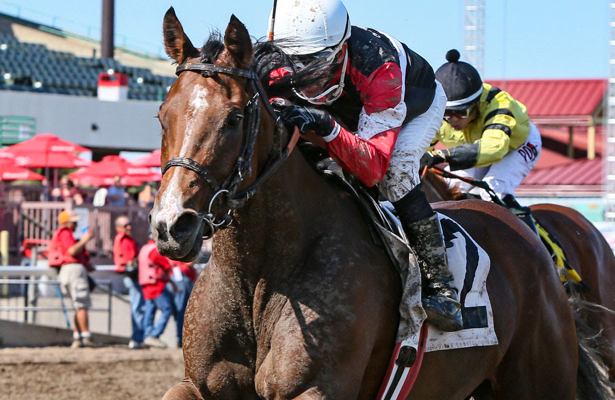 • CtD – Century Downs, Calgary, Alberta, where Escape Clause ran off to 10 ¾ and nine-length wins last month before migrating south to the winter quarters in Phoenix of her owner/trainer Don Schnell. Schnell, who has been training thoroughbreds for 40 of his 66 years, hasn’t seen the likes of what the filly, purchased for $3,791 at a sale in Manitoba (her sire, Going Commando stood for $990) has done. Escape Clause enters the $75,000 Kathryn Crosby Stakes, feature of Friday’s opening program of fall racing at Del Mar, with a career record of 17 wins from 24 starts and earnings of $296,840. Despite the winning streak, she’s 20-1 on the morning line in a field of 12 for the mile run that will be her turf racing debut.